Travel is exciting, inspiring, and can even be life-changing. As we age, we become less resilient to health risks and infections – and more likely to be managing a chronic condition – but this shouldn’t prevent us from seeing the world. Our new guide, Healthy Travel: a pocket guide for seniors, provides practical advice tailored to the needs of older travellers. It covers a range of topics including vaccinations, accessibility and mobility, travel stress, and chronic medical conditions such as diabetes, aches and pains, and cardiovascular disease. 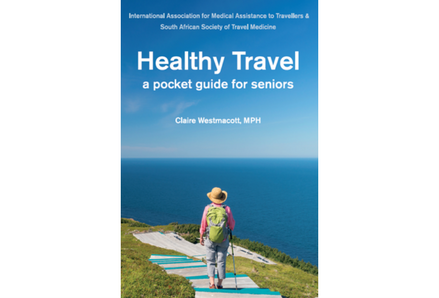 Healthy Travel was published in collaboration with the South African Society of Travel Medicine (SASTM). Book details, the table of contents, and a sample can be found here. The guide can be purchased from IAMAT (prices include shipping and handling). Healthy Travel was written by Claire Westmacott and edited by Dr. Garth K. Brink and Tullia Marcolongo. We caught up with Claire, Garth, and Tullia to find out what motivated them to publish this guide. IAMAT: Who should read Healthy Travel: a pocket guide for seniors? What do you hope travellers will take away from it? Seniors are increasingly becoming a larger proportion of international travellers. We wanted to create a resource that addresses their common questions and concerns so that they are prepared for their journey. We cannot always avoid the unexpected but we can prepare for it by understanding the risks and doing our best to manage them. Whether you are travelling with medication, managing a health condition, curious about travel health insurance, or just mindful of your health, we hope this guide can be of use. IAMAT: Dr. Brink, from a physician’s perspective, what is the most important thing for older travellers to remember when planning a trip? The single most important question that travellers should ask is “What do I need to do to ensure that I do not become ill while away?” There are so many variables that have to be taken into account. Each traveller is different; the destination and reason for travelling is not uniform, and the activities in which they will be involved vary. This is the ideal opportunity to ensure that you are up-to-date with regular immunizations as well as the applicable travel vaccines. Travellers who have a chronic medical condition should ensure that they are fit to travel and that their condition is well controlled. They should request documentation from their health professional that outlines the problem, the treatment prescribed and include the latest investigation results. IAMAT: What did you learn from writing this guide? What was the most challenging part? Travel health is a complex field, where health risks can vary depending on the traveller’s destination, itinerary, and their health status. This complexity made writing the book a challenge because there is so much to consider. We want this guide to be a starting point for travellers so that they can feel confident and stay healthy while they travel. IAMAT: Was Healthy Travel developed with IAMAT members in mind? How did that influence the topics covered in the guide? We developed the pocket guide because many of our members are older travellers. Older persons are one of the fastest-growing segments of the travelling population. They are also driving demand for more travel services geared to their needs. We hear from travellers in their senior years who are planning all types of trips – independently-organized itineraries, adventure travel, eco-tourism, cruises, and group tours. They want to know about vaccination recommendations for their age, how to travel with a pre-existing condition, and how travel health insurance exclusions and limitations will affect them. IAMAT: In recent years, have you seen an increase in the number of seniors from South Africa travelling internationally? What are some common destinations? My impression is that there are more seniors travelling (particularly since 1994) for a variety of reasons. Many are travelling to visit friends and relatives; others travel for business or to tick off places that are on their wish list. The destinations are worldwide – from Alaska to Australia, from Russia to South America, not to forget Europe and the Americas. But there are many seniors who do explore the most interesting countries and embark on such trips annually. Luxury cruises are also gaining in popularity. IAMAT: How is this guide different from The Older Traveller: A guide for the health professional, the publication that you collaborated on with SASTM last year? Healthy Travel is intended to be the companion book to The Older Traveller. It is an easy-to-use reference guide for travellers while The Older Traveller provides guidance for health practitioners on how to prepare their older patients for travel.